What are the statistics in my post-broadcast email? After each broadcast we'll send you an email which includes the vital statistics for your broadcast. The number of individual listeners that listened to your broadcast. We use the network and browser characteristics of each listener to determine their "uniqueness". This means that if a listener connects to your broadcast through different tabs in the same browser, only one "unique listener" will be recorded. The number of comments made by your listeners in Chat during this broadcast. The number of hearts your listeners posted during this broadcast. 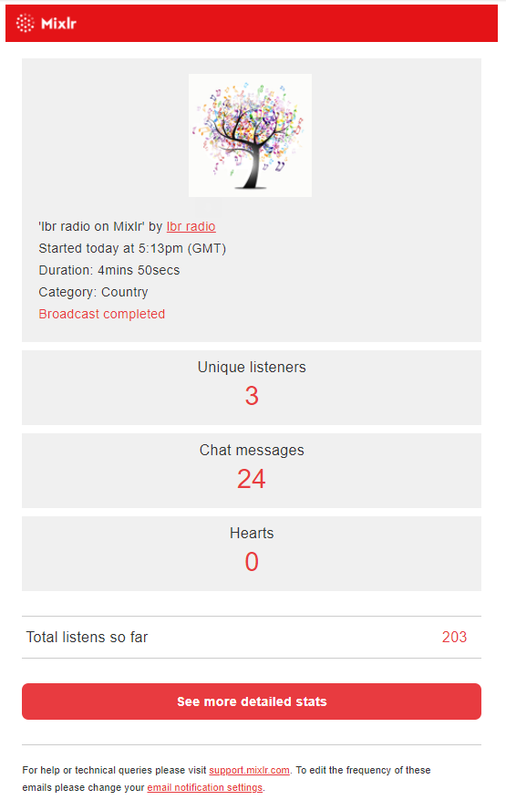 The email also shows your "Total listens so far" - this is the total number of listeners that you've had connecting to each of your broadcasts combined.